Top: The C.T.M.A. fleet on their berths in Cap-aux-Meules. Left to right, C.T.M.A. Voyageur, Madeleine and C.T.M.A. Vacancier. For me ferries are best experienced either when they are brand new or when they are 15+ years old and have accumulated a few of the layers, oddities, stories and legends that give a ship character. It�s probably ideal in fact to get them at both stages: first in pristine condition as the designers intended and then rather later after the accumulation of additional fittings, after the fixing of things those naval and interior architects didn�t think of or got wrong, and after the impact of refits to best equip them for new roles. Of course your �average passenger� would probably be appalled at the thought of dirty carpets and the state of certain 40-year old furnishings. 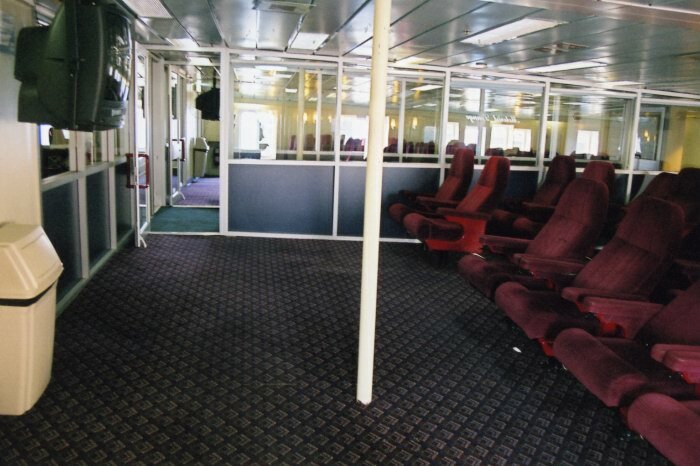 But I�m happily, I think, not an �average passenger� but very much a ferry enthusiast. I also wouldn�t grandly consider myself some sort of industry analyst; sure I can spend hours staring at those traffic figures in CFI and sniffing out who�s doing well and who�s falling back, where the money is and where the bailiffs are waiting. But I prefer to leave that kind of thing at work and once onboard, the pleasure of being at sea in an old ship often far removed from the trade she was built for usually easily overcomes any modest concerns at the poor state of a ferry. I adore the Seafrance Berlioz and could happily plough backwards and forwards to Caen for day after day on the Mont St Michel. Yet I would swap unlimited crossings on either of those as they are now for a snatched half hour let loose on the Windward II, the Texas Treasure or the Orestes. It amuses me when some people are so unforgiving about elderly ships, as if conversion to razor blades were the only thing they could possibly ever be fit for. The eccentricity, aged furnishings, rust, and occasionally, the grime that are an everyday fact of operational life on many ferries are mostly just an element of charm for me. 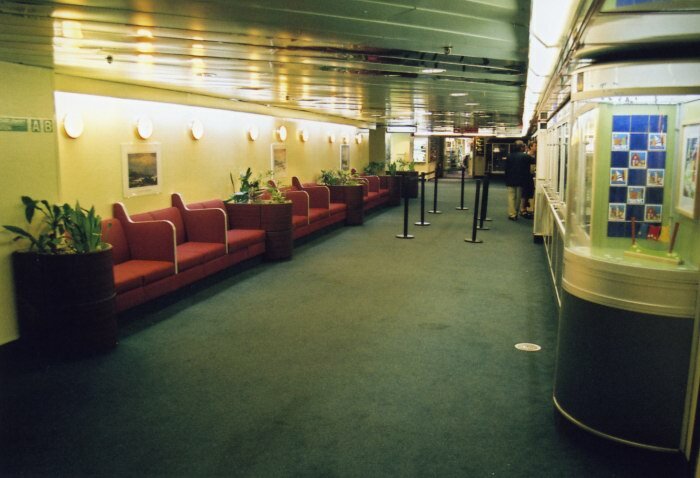 I treat ferries, quite unfairly as it happens, as rather disorganised and badly explained museums where it is up to the visitor to work out what happened when and what changed at which stage aided only by some poorly tended exhibits and a perfunctory modern floor plan. Perhaps infiltrated by the spirit of the amateur archaeologist, I find that it�s often very much a case of �the grimier the better�. Age doesn�t necessarily have to equal poor condition of course, as the Coho above any other ship I�ve ever been on would prove. But very often they go hand in hand as an inevitable matter of course: old ships migrate to the fringes, where they can eke out marginal existences with marginal operators on marginal routes and the standards are sometimes inevitably lower. Often then it�s on these margins where the biggest interest lies: of course it�s easy to nod knowingly that �ah the end was always near for that one� when an aged ferry is laid up or a fringe operator ceases service. But surely I�m not the only one left who sees it instead as a tragedy: another beloved ship whose unique smells, sounds, corners, creaks and quirks will never again be available for exploration. It�s not that brand new ships are charmless, quite the opposite in fact for many of the most recent additions. Rather though shiny newbuilds need a good few years to bed in and acquire a history. And so it�s the old ships with accumulated character and a real story behind them that we keep coming back to. 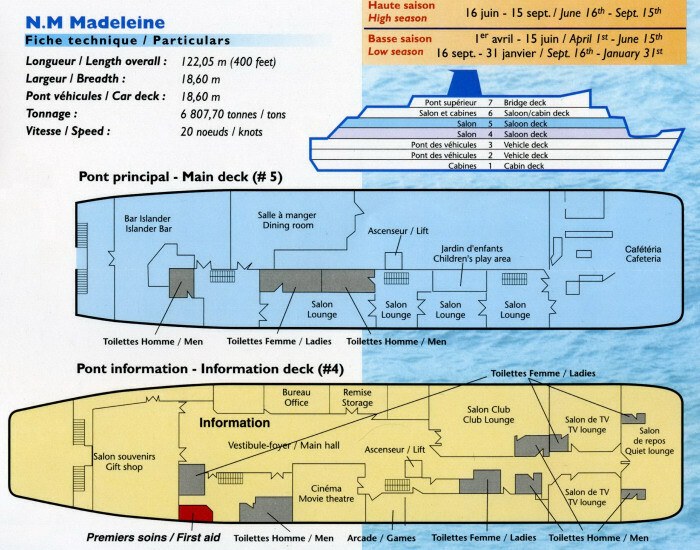 Above & below: Two views of the Deck 4 central arcade, with information desk on the port side. 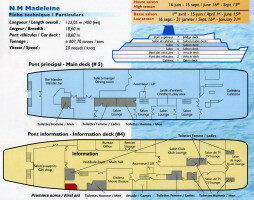 Above: The Madeleine on her berth in Cap-aux-Meules. All of which brings us, not coincidentally, to the aged but fascinating fleet of C.T.M.A. 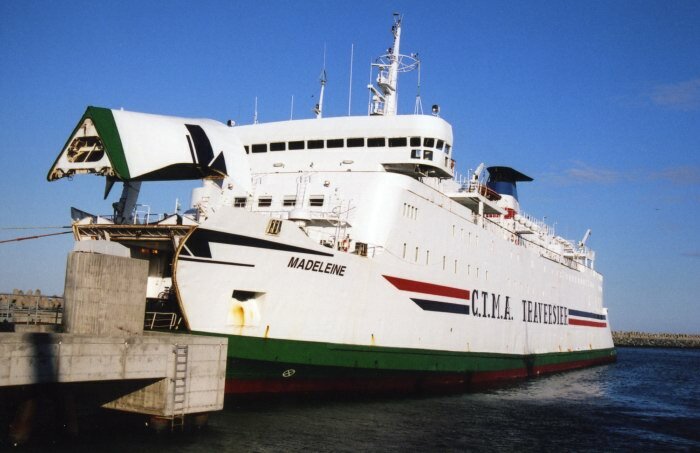 The Coop�rative de Transport Maritime et A�rien dominates sea travel to the �les-de-la-Madeleine which lie in the Gulf of St. Lawrence, about 100km north of Prince Edward Island. The Madeleine archipelago is made up of about a dozen islands lying in the shape of a half moon stretching across a distance of 65 km, six of which are connected by long, thin, sand dunes now overlaid by a single connecting main road. 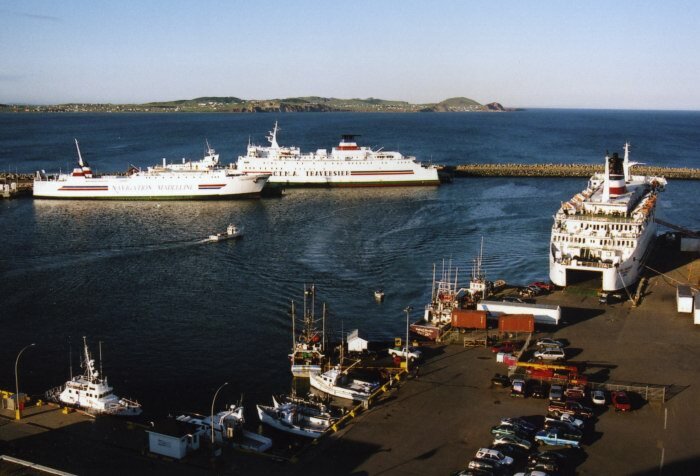 Access from Prince Edward Island itself is from the easterly port of Souris where C.T.M.A.�s ferry service is maintained by the Madeleine, the ex-Leinster, Isle of Inishmore, Isle of Inishturk. We joined the ship on her 1400 departure for Cap-aux-Meules. The Leinster of 1981 was the second of a pair of ships built for B&I Line at the Cork Verolme yard, replacing two of the earlier trio of first generation car ferries. They remained together with B&I until the Connacht of 1979 went to Brittany Ferries as their Duchesse Anne in 1988 � she is now Jadrolinija�s Dubrovnik. The Leinster remained however, and after opening her career on the traditional Dublin-Liverpool route, she fitted in Dublin-Holyhead sailings as well after 1982; from 1988 Liverpool was dropped altogether. The ship was edged out of the central corridor when in 1993 she swapped routes with the Isle of Innisfree (1) (ex-Niels Klim) and became the mainstay instead on the Rosslare-Pembroke Dock run; at this stage she was renamed, becoming the first Isle of Inishmore. B&I Line were taken over by Irish Continental Line (Irish Ferries) in 1991 and when the newbuild Isle of Innisfree (2) of 1995 was herself displaced at Holyhead by the new Isle of Inishmore (2) in 1997, our ship (now the Isle of Inishturk), was sales listed and after a period of lay-up in Le Havre was snapped up by the Canadians. 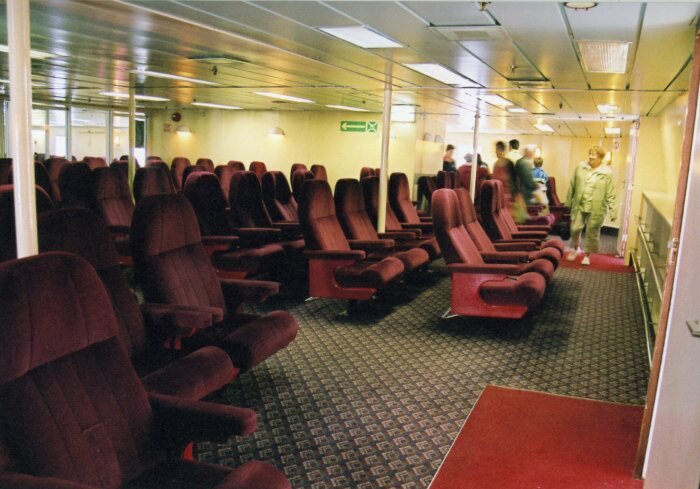 Originally the Leinster had a Ward & Austin interior, although presumably for reasons of economy this was rather less opulent than the same partnership created in their near twenty-year dominance as interior designers for Sealink. 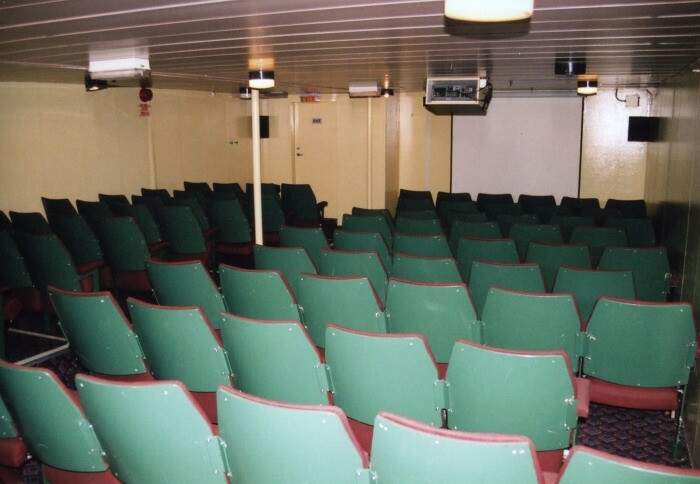 In any event things were thoroughly modified in a 1980s B&I refit and, a couple of mostly superficial Irish Ferries modifications apart, the ship is largely unchanged from this in her present incarnation. Like her sister, above a single vehicle deck with mezzanine levels and centre casing, she originally had a lower passenger deck given over mostly to cabins. With the ship soon sailing only on the shorter runs to Holyhead this was no longer entirely suitable, and there are now no passenger cabins in this area, with a large aft shop followed by a windowless central arcade offset to port with information and tourist office desks alongside to port and a cinema to starboard. Forward of this is a Club Class lounge, now very much out of action and in use for storage. Right forward are a series of lounges with comfortable reclining seats. 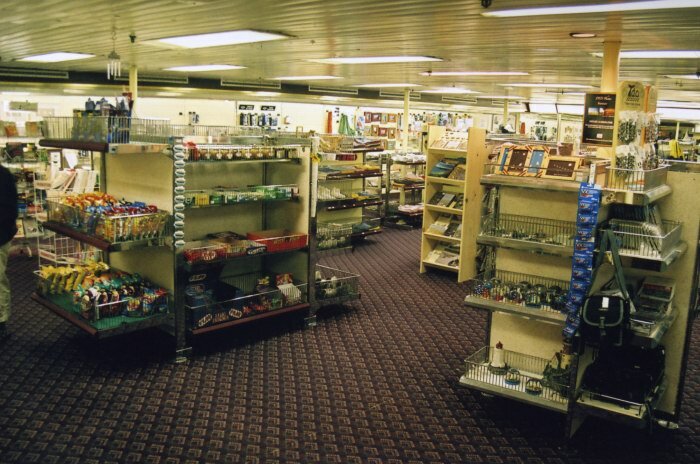 Above: The large shop at the aft end of Deck 4. 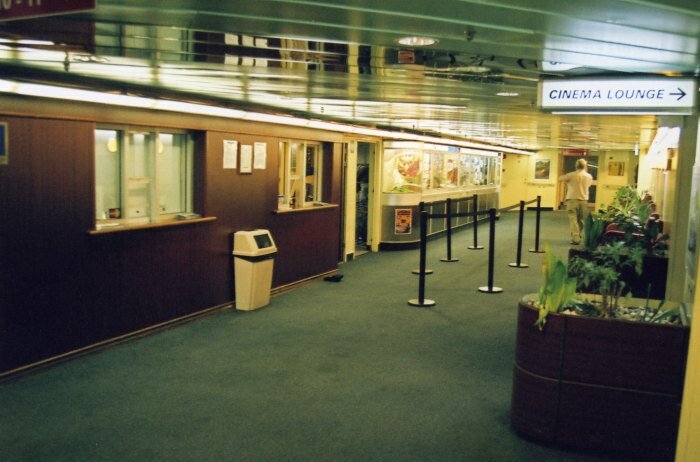 Above: Adjacent to starboard is this cinema, although it does not appear to see much use in the ship's current service. 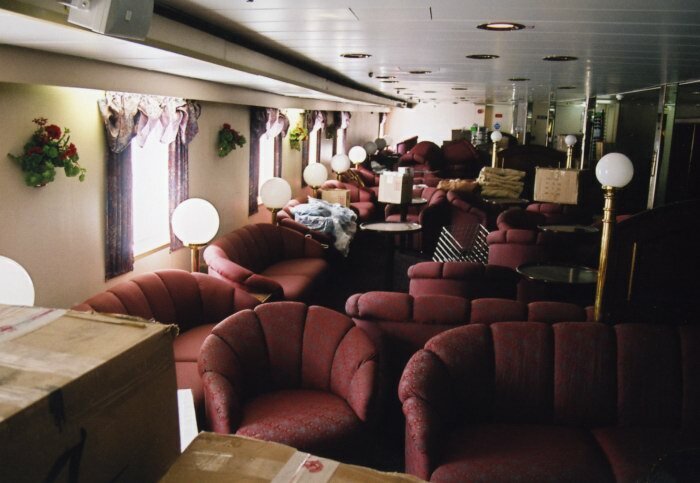 Above: The Club Lounge, forward of the arcade on Deck 4, in use for storage. Above & below: Right forward on this deck are a variety of lounges with comfortable reclining seating, signposted still as "Super Rest Lounges" from the B&I days. Above: A couple of areas are designated TV lounges.